Although she was often beaten and threatened by her husband, Teresa managed to suffer in silence and offer everything for his conversion. But the neighbours filed a report to the authorities and the young woman was ordered to live separately from her husband. Teresa found herself once more living with her parents where she gave birth to Maria Domenica. Her financial status led her to go and work as a ‘wet nurse' with a noble family. Later she became a governess of their daughter. Some time later she returned home to care for her elderly parents who were ill devoting herself at the same time to prayer and to works of charity. On the first day of November 1820 she had a vision and received the call for evangelisation. She wished to open a school at Ferentino where she was already well known, but while praying she heard a voice telling her ‘it is not in Ferentino that I desire you, but in Frosinone.' Invited by the Town Council, Maria Teresa opened her first school for girls in Frosinone in 1821. 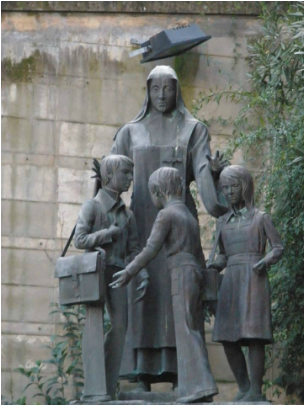 On the 23rd September 1827 she founded the Congregation of the Augustinian Sisters, Servants of Jesus and Mary, with the specific purpose of the education and Christian formation of youngsters. After a life dedicated to the service of God and her fellow humans, she died on January 22, 1850. Through her daughters, the Augustinian Sisters, the seed sown by Teresa has grown over the years into a huge tree that has spread its roots into the five continents, to continue the mission begun by this simple woman filled with courage and the love of God.